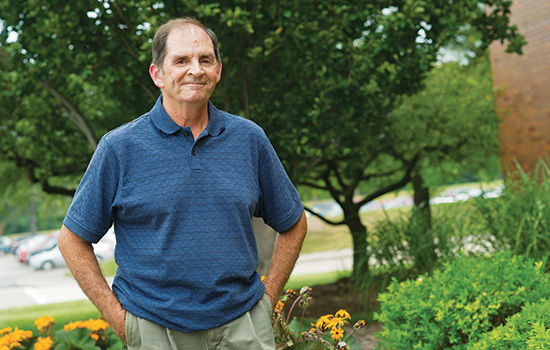 More than 7,300 students have graduated from RIT’s National Technical Institute for the Deaf in the past 45 years, and William Ingraham is regarded as the first. Ingraham, a native of the Rochester area, transferred to RIT in 1968 after taking two years of business administration at Alfred State University. “I was passing in college, but I needed a lot of help,” he says. Coincidentally, Ingraham ’71 (business administration) decided to transfer to RIT at the same time RIT was welcoming its first class of deaf and hard-of-hearing students—44 men and 26 women—to NTID. Throughout his previous school years, Ingraham had always been the only deaf person in his class. He sat in the front row and relied on friends to take notes for him as he focused on the teachers’ faces to try to understand what they were saying. Although he didn’t know sign language when he arrived, the teachers at RIT were easier to understand, and note-taking services were provided. Ingraham completed two co-ops with the Internal Revenue Service. “They liked my job performance during my co-ops and offered me a job one month after I graduated,” he says. That job turned into a 36-year career as an IRS agent, until his retirement in 2004, which has allowed Ingraham to have more time to play golf, travel and spend with his family. He also spends time as a respite worker for the family of a child with autism. Over the years, Ingraham has stayed in contact with his RIT/NTID classmates who have moved around the country after graduation. Ingraham stayed close to home and lives in the Rochester suburb of Brighton, just eight miles from the RIT campus. Other than crediting RIT with training him for a career, it also was where he met fellow student Mary Jo Nixon, who came to RIT in 1969. They were married nearly 40 years ago. She was the first NTID graduate hired as a staff worker and retired after 40 years at NTID. The couple has two children and two grandchildren. Ingraham has visited the campus many times over the years, including the 45th Alumni Reunion held in October. NTID President Gerry Buckley is grateful to Ingraham and the others from those early days of NTID’s inception. “It’s important as we celebrate the 45th anniversary of NTID’s first class this year to remember all of our graduates, but especially our pioneers like Bill who began a tradition of excellence and serve as role models for the following generations,” Buckley says.